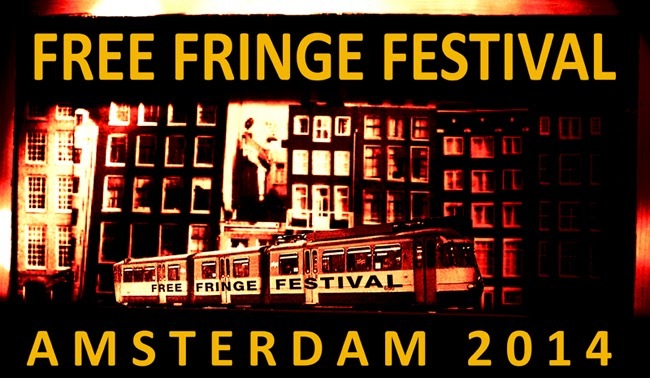 Free Fringe Festival Amsterdam: Free Fringe Festival Amsterdam 2014 is now open for proposals! Free Fringe Festival Amsterdam 2014 is now open for proposals! Last year, this wonderful little festival featured a wealth of theatre, music, dance, improvisation, film, animation, games, exhibitions, comics and all sorts of music and weird goings-on for 10 exhilarating days at Amsterdam's historic Vondelbunker, nestling in the bosom of the beautiful Vondel Park and other city-wide locations. In 2014 it is our mission once again to present a genuinely diverse programme of art and performance celebrating the thriving artistic community in Amsterdam and beyond, all for FREE. We offer technical support and an environment where creative freedom and respect for the artists’ vision is central. No costs are incurred by participating artists for hire of the venues. The Free Fringe Festival Amsterdam will take place 4 - 14 September 2014. Artists may also have the possibility to present their work in a preview for press and invited guests at Floating Grounds, a small open air festival on Midsummer's Day on an organic farm just outside Amsterdam and on Future Vision Amsterdam, Underground Arts & Culture Television Programme on SALTO 1. The festival is in the hands of the artists and is not controlled by the objectives of any corporate sponsors. Venues who would like to host or programme their own event under the umbrella of Free Fringe Festival Amsterdam in September 2014 are also invited to apply.